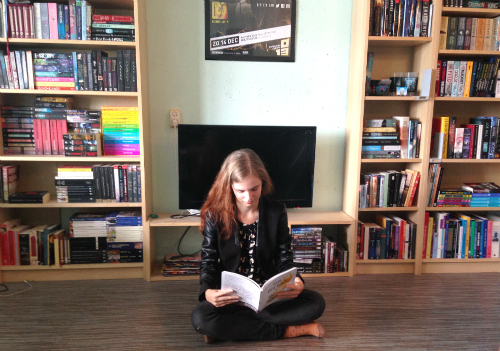 Ticker is Lisa Mantchev’s first novel since 2011 and her Théâtre Illuminata series. It’s a standalone book in a contraption-filled steampunk world, following a girl with a clockwork heart. Penny, like her two deceased sisters, has a rare heart condition which turned out to be nearly fatal for her as well. She receives a mechanical heart from a brilliant scientist – who turns out to have experimented on many people to a deadly outcome. 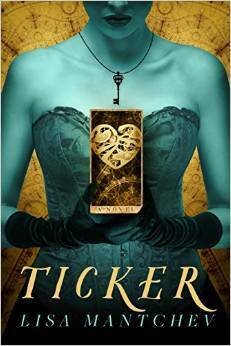 If you’re looking for a quick and fun romp through a steampunk world, Ticker is your book. It’s easy to get into, and it’s filled to the brim with the most unlikely steam-powered gadgets someone can think up. Some items include augmented body parts, mechanical beetles that crawl into your ear and mind-control a person, a flying army base, boxes that hold cake that open after a certain amount of time so your appetite won’t get spoiled, and, weirdly, mechanical butterflies that are collectible. In a way the world is rather shallow. Most of it is shown through name-dropping, and hardly any attention is spend on explaining how something like it would actually work. Ticker has very little science – which is a good thing for people that aren’t used to steampunk and just want to read a good story. My only gripe with the world was the fact that there are apparently mechanical butterflies flying around that can be collected. Why? WHY? Ticker reads like one endless adventure. There is hardly any downtime between plot points, and the downtime that is there, is used for character development. It’s very much plot-driven and things just keep happening. It helps that the book is on the short side, so there is no time to get burned out. The plot twists are never too out there that it’s hard to keep track of what’s happening – many scenes involve fighting, running away, or tracking other leads. My biggest complaint is that I didn’t find the main premise interesting or gripping enough to fully get into Ticker. Penny’s Ticker is showing signs of doing quits (which would result in her dying), and meanwhile the villain escapes from prison, her parents get kidnapped, she gets betrayed twice, she falls in love with an army guy. Add explosions and motorbike chases, and you have this book. It all seemed rather bombastic to me, and I felt very little for the main character’s problems. I can hardly blame the book for having a love interest, but it did make me shake my head. Truly, when all of this is happening, why is she falling in love again? It didn’t distract from the plot all that much, it even moved the plot along. I just wish YA books existed where the main character doesn’t fall in love. If you like gadgets, chases, action, combined with some family drama and a smidgen of romance, Ticker might be the perfect book for you. A girl with a clockwork heart must make every second count. When Penny Farthing nearly dies, brilliant surgeon Calvin Warwick manages to implant a brass “Ticker” in her chest, transforming her into the first of the Augmented. But soon it’s discovered that Warwick killed dozens of people as he strove to perfect another improved Ticker for Penny, and he’s put on trial for mass murder. On the last day of Warwick’s trial, the Farthings’ factory is bombed, Penny’s parents disappear, and Penny and her brother, Nic, receive a ransom note demanding all of their Augmentation research if they want to see their parents again. Is someone trying to destroy the Farthings…or is the motive more sinister? Desperate to reunite their family and rescue their research, Penny and her brother recruit fiery baker Violet Nesselrode, gentleman-about-town Sebastian Stirling, and Marcus Kingsley, a young army general who has his own reasons for wanting to lift the veil between this world and the next. Wagers are placed, friends are lost, romance stages an ambush, and time is running out for the girl with the clockwork heart.